A deciduous shrub found growing on moorland, preferring acid soil. Small dark fruits are borne usually mid July to August. Sarah Parker, James Waddington, Susan Holmes and Thomas Greenwood, of Haworth, were charged with trespassing on Haworth Moor. James Clayton stated that he found the prisoners gathering bilberries upon Haworth Moor. Mr Ferrand was with him. He took the cans from them and emptied the bilberries out. Fined one penny each and costs 15s. From Keighley Petty Sessions as reported in Keighley News. "Time out of mind poor people had been allowed to gather bilberries on the commons around. And the old squires, when out shooting, used to smile upon our industry and often generously give us a shilling to encourage us. But these were good old Tory days; there were no Conservatives then to claim the bilberries. Tories called it a virtue to gather wild fruit�.. I was ignorant sir, that I was poaching. I always thought it was a poor person�s right to gather wild fruit off a wild common��.. 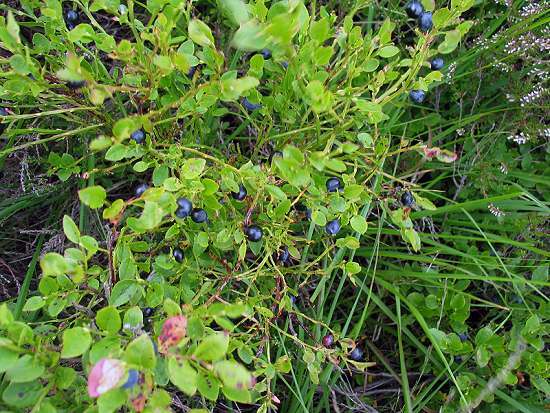 I had some comfort on my way home, for at Uppertown I was surrounded by people, and they all cried shame on the squire who could send a poor old man to prison for gathering bilberries off a wild common. I shall never forget how austere you were on the moor, telling the keeper to take my bilberries from me, and how he trampled them under his feet and wasted them�. Hard hearted and mean squires often lose their estates, and have to end their days in want and misery, and would be glad of a good bilberry dumpling. Beware squire, your sins may find you out. I was taught when young that a squire, however rich, was but a man. I have learnt in age that every squire is not a gentleman. I am sir, yours, the spirit of old."